This two-bedroom apartment in Melbourne has stunning views over Fawkner Park. When we arrived, the apartment was sparsely furnished after the owner had lived in Asia for many years. Our brief was to make the apartment feel more like home. The details about the transformation centred on the joinery the owner required for their book collection. We were given specific measurements and positions to use, but otherwise there were no other restrictions. The only item the owner wanted to keep was a silver and white wall clock. So, without a specific style to keep in mind, we used the green views of the park, the sleek contemporary lines of the clock and the joinery as our starting point. The 90s yellow and green colour scheme was traded in for fresh whites, shiny greys, lush and textured greens, and crisp black and white. 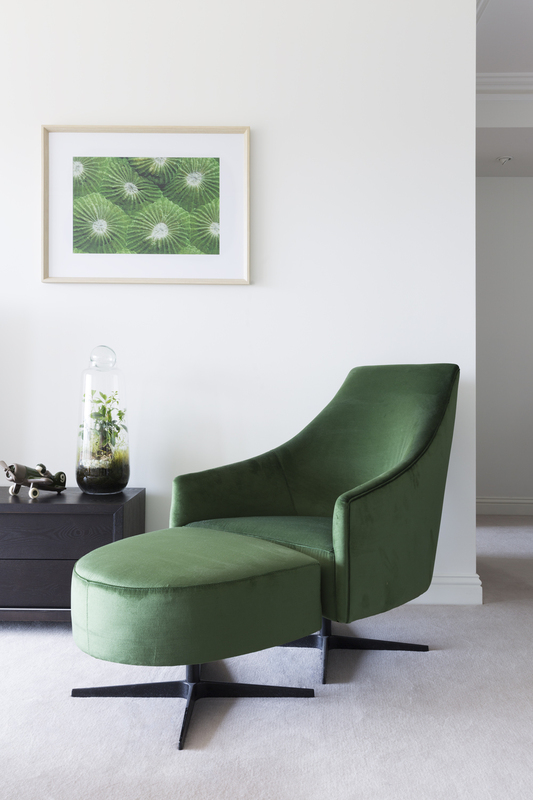 A masculine, contemporary feel that highlights the apartment’s park setting, and touches on the Asian connection for our client. We also incorporated a mix of textures in the custom-made bedheads, roman blinds, sofas, armchair and ottomans. The white marble table was specifically selected to reflect light into an otherwise dark dining room. The result is a quality and luxurious, yet understated apartment, that is a pleasure to come home to.